Microelectromechanical systems (MEMS) refer to a collection of micro-sensors and actuators, which can react to environmental change under micro- circuit control. The integration of MEMS into traditional Radio Frequency (RF) circuits has resulted in systems with superior performance levels and lower manufacturing costs. The incorporation of MEMS based fabrication technologies into micro and millimeter wave systems offers viable routes to ICs with MEMS actuators, antennas, switches and transmission lines. The resultant systems operate with an increased bandwidth and increased radiation efficiency and have considerable scope for implementation within the expanding area of wireless personal communication devices. 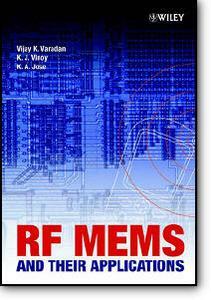 This text provides leading edge coverage of this increasingly important area and highlights the overlapping information requirements of the RF and MEMS research and development communities. Provides an introduction to micromachining techniques and their use in the fabrication of micro switches, capacitors and inductors Includes coverage of MEMS devices for wireless and Bluetooth enabled systems Essential reading for RF Circuit design practitioners and researchers requiring an introduction to MEMS technologies, as well as practitioners and researchers in MEMS and silicon technology requiring an introduction to RF circuit design.